I’m frequently asked about using colloidal silver in a CPAP machine, in order to help prevent the bio-fouling (i.e., microbial contamination) that’s so common to the water used in the reservoir, as well as the air tubes and breathing apparatus. 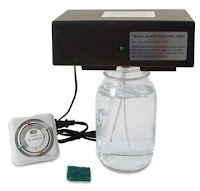 Some people write me asking if adding colloidal silver to the reservoir in their CPAP machine will keep the water and breathing apparatus from getting “funky” (i.e., coated with gunk and microbes). Other people want to know if using colloidal silver in a CPAP machine will help with their breathing problems, or help keep their lungs infection-free. For those who don’t know, a CPAP machine is a “Continuous Positive Airway Pressure” machine -- a device that helps people with a condition called sleep apnea in which airways constrict and normal breathing stops periodically during sleep. The CPAP machine allows sleep apnea sufferers to breathe more easily during sleep, and thus keep their body’s oxygen levels from getting too low. To do this, an air mask is worn at night. The device increases air pressure in the airways to help keep them open and keep oxygen flowing into the lungs while the individual is sleeping. However, to prevent the soft tissues in the throat and lungs from drying out and cracking due to the added air pressure, a small amount of distilled water is usually added to a water reservoir in the CPAP machine. Tiny amounts of this water are picked up by the air current, which in turn helps keep the soft tissues in the throat and lungs moist. This small amount of moisture helps prevent the drying and cracking of tissues in the throat and lungs so often experienced by CPAP users. The problem is, sometimes the water in the CPAP machine, if not changed frequently enough, can get contaminated with bacteria or fungus, and CPAP users can end up with serious chronic upper respiratory infections, bouts of bronchitis or even pneumonia. “…I have been frustrated with sleep apnea and having to use the CPAP device. I was diagnosed in 2008 and since then have had re-occurring bouts of what has been diagnosed as sinusitis. Late last year (Oct) I contracted a rather serious bout of bronchitis. I was prescribed the usual antibiotics and inhaler and after about 6 weeks started to show some signs of recovery. Then in April it came back and the same sort of regiment was applied again, another 6-8 weeks. Early July again…this time I got into a local clinic as my GP was booked, same routine antibiotics and inhaler. I had just recovered from that episode when it hit again this time sending me to the ER as now my breathing was severely compromised. Chest Xray’s led the Dr. to diagnose bronchitis once again and once again the aforementioned regiment -- however each time the antibiotics seemed to change and Prednisone was added. I suspected something with my machine must be causing this and despite a thorough cleaning on regular basis I decided it was time for an upgrade. The technician examined my old machine closely and was able to get inside and I was horrified to hear him tell me it was infected with mold! …So I suspect I have mold that has taken up residence in my nasal cavity if not lungs as each night the constant air pressure sends these spores into my lungs causing the bronchial like conditions. Many of the symptoms a lot of CPAP users describe sound so familiar, sinus headaches, chronic infections, facial pressure, nasal discharge, dry and very wet cough, extreme fatigue and the list goes on. That pretty much sums up the experiences many people have had with their CPAP machines becoming contaminated with microbial growth that can later cause upper respiratory infections such as sinusitis, bronchitis, pneumonia and more. To help resolve this potentially very serious issue, a lot of CPAP users add anywhere from a teaspoonful to an ounce or two of 10 ppm colloidal silver to the distilled water in their CPAP machine’s water reservoir. They claim this helps keep the water in the reservoir disinfected and clean of microbial buildup. It reduces the frequency with which the water needs to be changed. And more importantly, it is said to help prevent the chronic upper respiratory infections so often associated with CPAP machine usage. I’ve never used a CPAP machine, so I've never had the opportunity to experiment with using colloidal silver in one. But the operative word is "experiment" because that's exactly what people who use colloidal silver in their CPAP machine are doing. That’s because there are no clinical studies showing that it's safe to breathe colloidal silver into your lungs for hours a day on a regular daily basis. The animal studies I’ve seen have demonstrated that after 90 days of breathing an atomized colloidal silver mist into the lungs, animals started accumulating silver in their lungs, which led to reduced lung function over time. Of course, as in many animal studies in which silver is involved, overly-large dosages of silver were used by the researchers. So it’s difficult to know for sure how those studies may, or may not, apply to humans inhaling small amounts of colloidal silver into their lungs at night through their CPAP machines. So while these animal studies do not constitute “proof” that small amounts of silver inhaled into the lungs regularly, over long periods of time, is bad for you, at the very least they certainly indicate that the lowest levels possible should be used for anyone considering experimenting with this idea. I have tried a full reservoir of colloidal silver and it appears to work fine insofar as the uptake and therapy go. I will say that I have no fungal growth problems with my hose or nose/mouth mask on my CPAP when using colloidal silver in the reservoir. My wife had a fungal problem in her reservoir and hose until she started adding an ounce or two of colloidal silver to her machine and now she has none. Hope this helps." I find that particular anecdotal account quite interesting. It appears from the above anecdotal account that adding too much colloidal silver to the water reservoir (i.e., straight colloidal silver, instead of few ounces mixed into a reservoir full of distilled water) negates the purpose of the distilled water, which is to help keep the soft tissues in the nose, mouth and throat from drying out. That’s probably because of mineral residue (i.e., silver) that ends up coating the lungs and afterwards drying them out, sort of like the spots on a newly cleaned glass that’s been sitting in the dish rack for awhile to dry. But adding just the right amount of colloidal silver to the reservoir (i.e., an ounce or two of 10 ppm colloidal silver to 14 ounces of distilled water) appears to stop microbial growth in the water reservoir and the breathing apparatus without the negative effect of drying out the mucous membranes caused by using straight colloidal silver in the CPAP machine. "I use colloidal silver in a CPAP, and the water does not get funky. I used to have to clean my water tank and hose about every week. Now I clean it about every gallon of distilled water, which is usually a month or so. Once cleaned, I add an ounce of colloidal silver (just for the first fill). Now there are no weird smells or funkiness. Plus it could be a coincidence but I used to always get bronchitis - I have not had a problem since I began doing this." So according to this anecdotal account, it appears that the addition of a relatively small amount of colloidal silver to the CPAP water reservoir (i.e., one ounce) helps keep the water disinfected, and helps prevent microbes from reaching the lungs and triggering bouts of bronchitis. “I have COPD. I also use a CPAP for sleeping and use both an ampule of Albuterol and about 1 ounce of colloidal silver in the reservoir along with filling it with distilled water. This combination has kept my lungs clear for years with no problems. “I have sleep apnea. And when I go to sleep, I use a machine to help me breath thru the night. I add colloidal silver to the water reservoir. “I am using Electrically Isolated Silver [i.e., ionic silver – ED] in my CPAP machine's water reservoir (distilled water w/ 1 Tablespoon of EIS). …My dentist complimented on how healthy my mouth has been lately. I've been with him for decades and always had trouble with gingivitis. In the above case, only one tablespoon full of colloidal silver is added to the CPAP machine’s water reservoir, and a rather pleasant “side effect” was noticed, i.e., no more gingivitis. “I also use a CPAP with a heated humidifier. I found that after 2 weeks the tubes would start to get a mildew smell and I would have to soak everything in vinegar to get rid of it. I then began to put colloidal silver into the humidifier about 2 years ago and I never have to clean the tubes anymore as they no longer get mildew in them. “Just a bit of information you may be interested in. I was diagnosed with Asbestosis (not cancerous) a few years ago. The medication (3 different puffers up to 4 times a day) was improving me very slowly. Then I put colloidal silver in my CPAP machine for 2 nights then nothing for 2 weeks. Then 2 nights again. Now I just do the silver 2 nights about every 4 weeks and no other medication. Notice the individual used very small amounts of colloidal silver, and only periodically, in his CPAP machine. His improvement was gradual. But he was able to wean himself off all medications for his asbestosis lung problems by doing so. Very interesting! “For years, I have placed one silver American Eagle into our 5-gallon water-cooler jugs that I refill from the filter on my tap. It keeps slime from forming in the bottles AND in the cooler. So, that's what people tell me they're doing. And they claim they have no problems, so far. And that’s probably because adding an ounce or two of colloidal silver to a 14 ounce reservoir dilutes the silver sufficiently so that the lungs can easily clean themselves of any residual silver. However, considering the lack of good, solid clinical information about inhaling aerosolized colloidal silver into the lungs for hours at a time each day and doing so for days, weeks or even months on end, I think it's best to err on the side of caution. Until better information becomes available, I’d personally either not do it at all, or only do it periodically rather than every single day. Or at least stick to the smallest amount of colloidal silver needed to keep the water reservoir of the CPAP machine from becoming fouled with microbial growth. I say this because people once thought nebulizing colloidal silver into the lungs through a medical nebulizer was perfectly safe to do on a daily basis. There's even a colloidal silver generator manufacturer who supplies a medical nebulizer with his generator so you can nebulize the colloidal silver every day. However, when clinical studies on animals were later conducted by independent researchers, it was demonstrated that after 90 days of inhaling silver particles on a daily basis, the particles began to accumulate in the animal’s lungs. So, while I personally have no problem with inhaling colloidal silver into the lungs through a nebulizer when I have an upper respiratory infection, it's definitely NOT something I'd do on a daily basis for weeks and months on end. I’d only do it periodically, for a few days in a row, whenever I have an upper respiratory infection, because I don't want silver particles accumulating in my lungs, however rare that might be. The lungs are wonderful contraptions; under normal circumstances they're very effective at self-cleaning, which is to say, at keeping themselves from being coated with dust, pollution and other substances that you breathe in on a regular basis. But if you overwhelm the lung's mechanism for self-cleaning by breathing in too much of a particular foreign substance (such as silver, for example), hours-a-day, day-in and day-out for long periods of time, then it appears based on the latest animal research that you could possibly end up with silver accumulating in the lungs, and even incur lung damage over time. So once again, it’s a situation where moderation in all things should be the watchword. I’m not telling anyone what to do. I know many people tell me they’ve been using colloidal silver in their CPAP machines for years. I’m just setting forth the facts as I understand them, and letting people make their own decisions. Colloidal silver can be purchased at just about any local health food store, or through a number of online sources including Amazon.com. However, it’s quite literally one of the most expensive and heavily marked-up nutritional supplements in existence. Health food store owners, for example, often charge as much as $20-$30 for a tiny four-ounce bottle. Yet the cost to manufacture four ounces of colloidal silver is about 12 cents. Yes, I said twelve cents. Of course, people are willing to pay through the nose for colloidal silver, since it’s safe and natural, and works so well against germs, mold, fungus, and even viruses. But thankfully, there’s no need to pay such exorbitant prices for colloidal silver, when you can make your own, quickly and easily, in the comfort and privacy of your own home, for about 36 cents a quart. Yes, you can make it yourself for its actual cost, and altogether skip the sky-high mark-ups charged by health food stores!